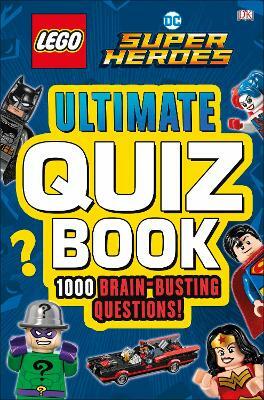 This fun LEGO(R) DC Super Heroes trivia quiz book is packed full of questions about your favorite LEGO DC Super Heroes characters, including Batman, Wonder Woman, Superman, Harley Quinn and the Joker. Find out how much of a superfan you are with mind-boggling questions, fun picture rounds, and bonus genius questions. Become a quiz master and test your friends and family with hours of entertaining LEGO DC Super Heroes trivia. With chapters on Super Heroes and supervillains, you can find out incredible facts about every aspect of the LEGO DC Super Heroes Universe including amazing superpowers, cool vehicles, and secret identities. How did the Flash get his powers, where is Superman's secret base located, and what is the name of Green Lantern's alter ego? Which supervillain was once elected president and where does Nth metal come from? Discover the answers to all these questions and many more in the the LEGO DC Super Heroes Ultimate Quiz Book! (c)2017 The LEGO Group. DK was founded in London in 1974 and is now the world leading illustrated reference publisher and a member of the Penguin Random House division of Bertelsmann. DK publishes highly visual, photographic non-fiction for adults and children. DK produces content for consumers in over 100 countries and over 60 languages, with offices in the UK, India, US, Germany, China, Canada, Spain and Australia. DK's aim is to inspire, educate and entertain readers of all ages, and everything DK publishes, whether print or digital, embodies the unique DK design approach. DK brings unrivalled clarity to a wide range of topics, with a unique combination of words and pictures, put together to spectacular effect. We have a reputation for innovation in design for both print and digital products. Our adult range spans travel, including the award-winning DK Eyewitness Travel Guides, history, science, nature, sport, gardening, cookery and parenting. DK's extensive children's list showcases a fantastic store of information for children, toddlers and babies. DK covers everything from animals and the human body, to homework help and craft activities, together with an impressive list of licensing titles, including the best-selling LEGO(R) books. DK acts as the parent company for Alpha Books, publisher of the Idiot's Guides series and Prima Games, the world's leading publisher of strategy content for PC and console video games.